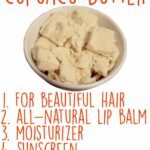 10 Delicious Beauty Benefits of Cocoa Butter - beautymunsta - free natural beauty hacks and more! 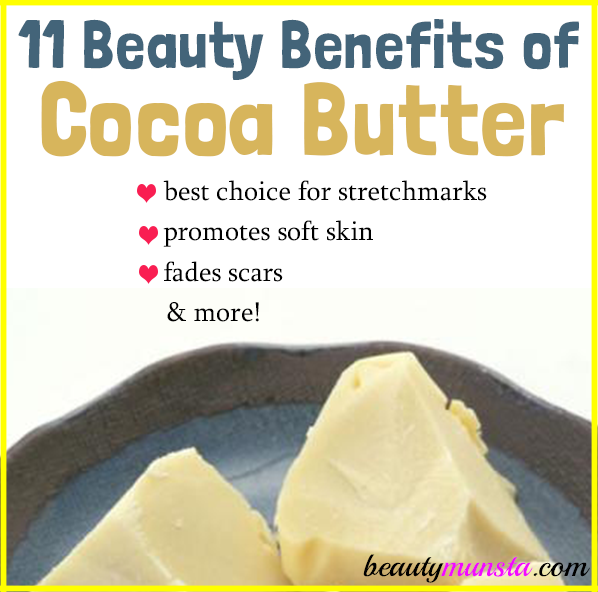 Check out 10 beauty benefits of cocoa butter for your skin, hair and more in this article! Chances are that if you love chocolate, then you’ll more than love cocoa butter! Cocoa butter is a natural plant butter that is extracted from cocoa beans. It’s one of the main ingredients in chocolate. Many cosmetic products like body lotion, lipstick, face creams and more contain cocoa butter too! 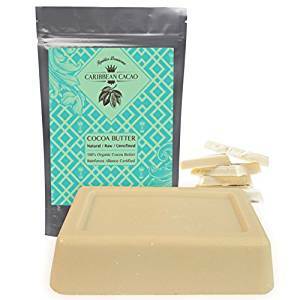 Most people love the delicious chocolaty scent cocoa butter leaves on their skin and hair but if you find it overpowering, then you can still enjoy the beauty benefits of cocoa butter by purchasing deodorized cocoa butter! This is still cocoa butter, only that it’s scent has been removed. Okay, now let’s take a look at the ingredient profile then 10 delicious beauty benefits of cocoa butter! When it comes to preventing or reducing stretch marks, like pregnancy stretch marks, cocoa butter is your best bet! It is far richer in vitamin E than shea butter, another popular stretch mark remedy, which makes it better to use for stretch marks. 1 cup of cocoa butter is said to contain 20% vitamin E (source). Vitamin E is immensely beneficial in fading scars and healing skin. Cocoa butter also contains vitamin K and fatty acids such as oleic, linoleic, arachidic and palmitic acids that lubricate skin and form a protective healing layer that helps fade stretch marks faster. Want to know an amazing secret of attaining baby soft skin?! Simply drop a 1 inch chunk of cocoa butter into hot bath water and watch your skin become amazingly silky! The hot water will melt down the cocoa butter into an oil which will disperse into the bath water and moisturize your skin on a whole new level. 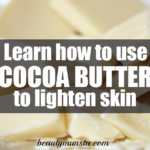 This is actually a very easy way of moisturizing your skin with cocoa butter. Nourishing Body Cream: Into a double boiler, add ¼ cup of cocoa butter, ¼ cup of shea butter and ¼ cup of coconut oil. Now melt the ingredients at a medium low heat over the stove. Once melted, pop the container of melted oils into the refrigerator for 15 minutes for it to cool down and partially solidify. When the time is up, beat the semi-solid oils into a whipped cream-like consistency using a hand mixer. You can add a few drops of an essential oil like lavender (6-12 drops) for scent. Store in air tight containers in a cool dry place! Sweet Vanilla Choco Perfume: Melt down 1 tbsp of cocoa butter in a double boiler. Once melted, stir in 8 drops of vanilla essential oil and 4 drops of cardamom essential oil. Now pour this into a round salve tin and let it set in the refrigerator for 15 minutes. Apply on pulse points, collar bones, hair ends and other key areas. Chocolate Lip Balm: In a double boiler, melt 2 tbsp of cocoa butter and 1.5 tsp of beeswax pastilles until liquid form. Now remove from heat and stir in 1 tsp of raw honey, 1 tsp of cocoa powder and 4 drops of peppermint oil. Make sure to whisk them very well to break up the cocoa powder clumps. If you don’t want cocoa powder, leave it out. Now pour the mixture into lip balm tubes or lip balm containers. Coco Lotion: Melt 1 cup of cocoa butter and ½ cup of coconut oil in a double boiler until they liquefy. Once liquefied, stir in ½ cup of almond oil. Now place the container with the melted oils in the refrigerator to partially solidify for an hour or two. Or, keep it in the refrigerator to speed things up for a shorter time. When the time is up, whip the partially solidified ingredients into a whipped cream-like consistency using ahand mixer. Transfer to glass jars like these ones and store in a cool dry place. Since it’s moisturizing and rich in anti-oxidants, cocoa butter is a good choice for thwarting premature aging. It smooths wrinkles and fine lines. Anti-Aging Night Cream: You can make a night cream or facial cream with cocoa butter, provided you don’t have oily/acne prone skin. Simply melt down 1 tbsp cocoa butter, 2 tbsp shea butter and 1 tbsp jojoba oil in a double boiler. Then pour into sterilized container and use every night on your face. Scar Fader: Melt 2 tbsp of cocoa butter, 1 tbsp of shea butter and 1 tbsp of coconut oil in a double boiler. Remove from heat once melted and stir in 10 drops of helichrysum oil, 5 drops of lavender oil and ½ tsp vitamin E oil. Pour into a sterilized container to set before using. Cocoa butter doesn’t irritate skin at all. 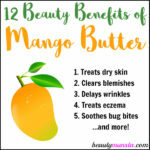 It actually soothes sensitive skin and helps reduce inflammation. 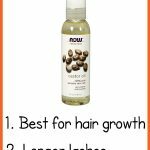 What’s more, it’s incredibly moisturizing and locks water into dry skin. This makes it good for eczema and psoriasis. 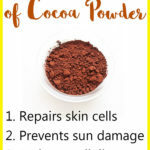 Make the DIY lotion with cocoa butter above and use it on eczema/psoriasis-affected skin right after a shower when your skin is still wet to help soften and hydrate dry and rough patches. If you have dry damaged and frizzy hair, your hair will appreciate the deep moisturizing qualities of cocoa butter. You can use it straight onto damp hair by scooping a tiny piece from the jar and rubbing it vigorously between your fingers. Or make a moisturizing hair cream by melting cocoa butter and any liquid oil of your choice to form an easily applicable mixture. Always look for 100% pure quality cocoa butter without additives. My recommended brand is Caribbean Cocoa Butter that comes in a 1 pound block. It’s also edible so you can use it to make homemade chocolate and smoothies! If you don’t like the chocolaty smell of cocoa butter, you can buy pure deodorized cocoa butter from here. You can also purchase cocoa butter wafers instead, as these are could be more convenient to use for you.